When the Charlotte-Mecklenburg Historic Landmarks Commission announced it would seek approval from the City Council for an option to purchase the Excelsior Club at 921 Beatties Ford Road, people on the city’s westside breathed a temporary sigh of relief; it was the first step in restoring a jewel in the crown of Charlotte’s African American history and keeping it from the wrecking ball. Weeks later came the unfortunate news that the Council had not approved the purchase, and the fight to save it would have to continue. With the West End threatened by rising rents and taxes and the looming specter of gentrification, the historic African American communities that surround the club are no strangers to facing such threats. They fear that they are losing hold of the symbols of their history and, as everyone on that side of town will tell you, there are very few places that define that history like the Excelsior. Jimmie McKee, who was raised in the Biddleville neighborhood around Johnson C. Smith University, started the Excelsior Club in nearby Washington Heights in 1944. McKee was a mail clerk during the day and tended bar at night at bars and parties to help support his brothers and sisters, and he was struck that Charlotte’s black community didn’t have a nightclub to cater to the crowd that might not want to go to the various bootleg gambling and liquor joints dotting the city. By 1940 he had married his wife Minnie, and by 1944 he managed to purchase a two-story wood-frame house on Beatties Ford Road to start the club he dreamed of. The name was suggested by McKee’s lawyer, who had always advised him to “exceed all others” in his endeavors. In 1952 McKee extensively remodeled the house in the flat smooth lines of the Art Moderne style after visiting several similar clubs around the country, and added two banquet and meeting rooms upstairs to accommodate up to 300 people. When the Excelsior opened it was the first black nightclub in the city, and its exclusive membership list included a who’s who of Charlotte’s black professional middle-class: doctors, lawyers, educators, ministers, businessmen, and political leaders that lived on the West End and in the vibrant Brooklyn community downtown. Candidates for membership were carefully screened and had to be recommended by a member, and it became the place to see and be seen among the chosen few. McKee died of cancer the next year in 1985, right after he sold the club to Ken Koontz. Koontz had started going to the club in 1969 as a JCSU student, and soon after he secured a job as the first African American news reporter and anchor at WBTV. From there the club passed to N.C. State Rep. Pete Cunningham and then in 2006 to prominent local civil rights attorney James Ferguson, who worked with Julius Chambers in the 1970’s to litigate school desegregation cases. It eventually made it into the hands of Cunningham’s wife, fellow State Rep. Carla Cunningham, who inherited the property after her husband’s death. She foreclosed on Ferguson and shuttered the club, ostensibly for renovations, but it never reopened. The building had fallen into disrepair and had been cited for various code violations, and despite the stated intentions of all parties for it to re-open the fate of the Excelsior seemed unclear. Attempts at restoration and reimagining have not panned out, and the club was losing profits as the city of Charlotte alternatively began to explode in growth and the land around the club rose in value. Appeals were made to the Landmarks Commission as the legacy of the Excelsior and its impact on the black community in the city was undeniable, and indeed it had been declared a designated historic landmark in 1986. That offers no protection if the owner wants the building sold or demolished, however, and the Commission and Charlotte’s City Council are still exploring ways to save the structure while it is on a one-year demolition moratorium. To Cunningham it is a business decision; if the Commission can meet her price she will sell. As of now it’s a stalemate, as the Council refuses to meet her demands and both sides seem entrenched. A Facebook group called Friends of the Historic Excelsior has appeared, encouraging supporters to attend City Council meetings wearing black and to send letters and emails to Council members urging them to save the club. To many on the West End who have seen their long-cherished community increasingly encroached on by those from outside who have no knowledge or regard for its rich history, it is the very symbol of the balancing act between preservation and development that teeters around them every day. Many will freely admit that progress is a great thing in their neighborhood and encourage it; but there is not one person who wants to see that come at the price of the loss of such an important place. Largely ignored and relegated to the sidelines as their communities have been torn down and they have been forced out over the years, Charlotte’s black neighborhoods see the Excelsior as a symbol in their fight to survive and to reclaim their political, social, and cultural identity. 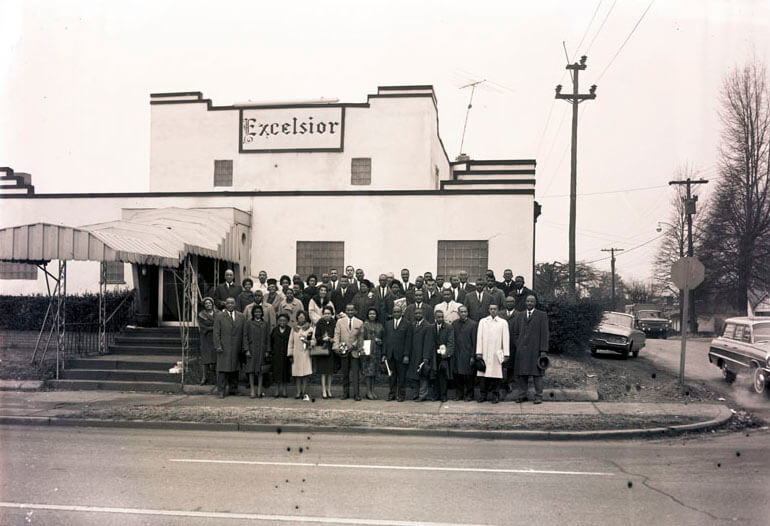 As Charlotte and the West End in particular continue to face accelerated changes and growth, the fate of the Excelsior may be the first in a long line of battles to preserve a rich legacy that is increasingly at risk.